I was surprised at how lame it was because as a former Seattleite I've been very impressed with the PI's efforts to 'electronify' its news enterprise. They've made great strides and I consider their site head-and-shoulders above the other ten or so newspapers I examine daily through my Opera browser. But I wouldn't fault the PI for this reader. It's really a Microsoft product first unleashed upon the NY Times and now will be tried out by Forbes.com and some other publication. I'm confident it will fail in short order. It's about as bad as 'Bob', the floating paper clip, was on Windows. Nonetheless, off-line reading of news content does represent, I believe, the newspaper industry's holy grail. 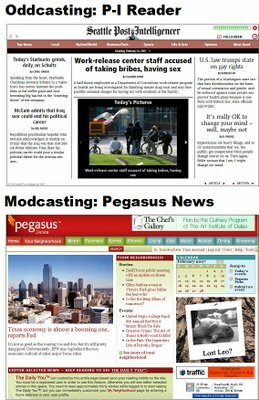 While the Pegasus News site takes an interesting approach to enable a reader to 'fine-tune' his engagement with newspaper content, it still requires an active connection to access and peruse it. If a newspaper consumer can avail himself of the types of navigation tools Pegasus offers, but employ them when *not* actively connected to the internet, then the full portability of a hardcopy newspaper can be married to the kind of serendipity you advance as essential to a newspaper's function and value. Just how to accomplish this off-line capability and exactly what form(s)it may take remain questions yet to be answered. The PI reader I believe is a clumsy first effort. The path to off-line capability, however, need not be confined solely to internet-based technology, as is the Microsoft reader product. The key, I believe, nonetheless lies in the distribution mechanism; but I suspect the internet may not be the best choice. The Microsoft reader's bloated infrastructure --reflecting its reliance upon an active IP network connection and an all-too-complicated machine-- offers what is, essentially, an over-engineered 'solution' for what is really a rather simple distribution problem. It's understandable that network technologies serve as the backbone for this reader, but that's also why it's so clumsy and unsatisfactory. navigation capabilities (like those of Pegasus) to empower an off-line user in extracting value from the news fed him.